If you want to have a totally new pasta feeling, make it yourself. 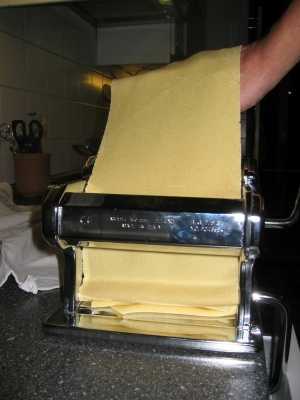 Home made pasta is ready after about 2 minutes cooking and gives you the real "al dente" taste. It's tender but also firm. 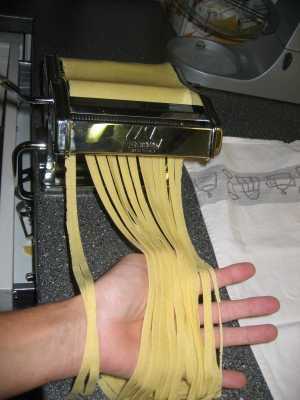 Italians realy like their pasta. 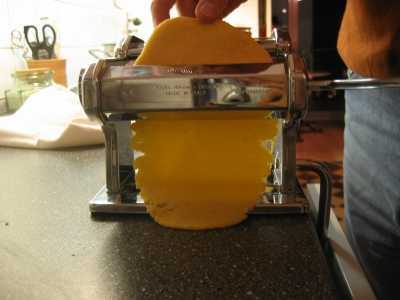 They have stores, that sells "pasta fresca", handmade tagliatelle, ravioli, tortelini, that are made some hours ago and not dried yet. Or "mama" makes it on Sundays. 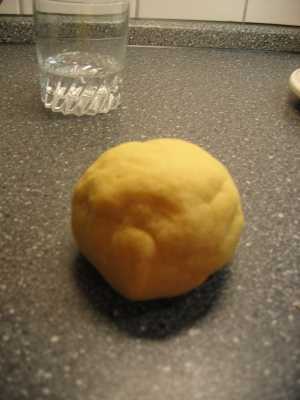 For Spaghetti, only use water and no egg. 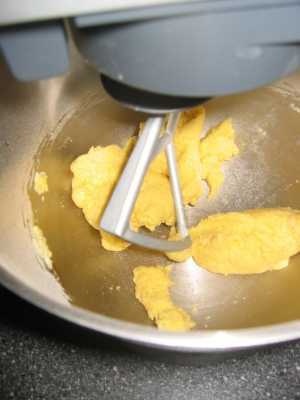 As you can't add liquid after you have made the pasta, it is very important to get the liquid - solid ratio right from the start. 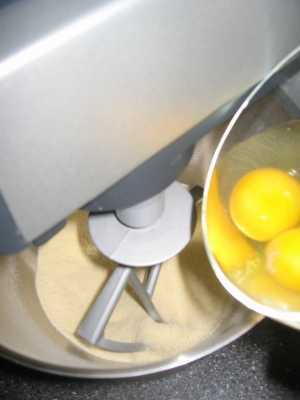 The egg and water should weight 43-45% of the weight of the semolina. 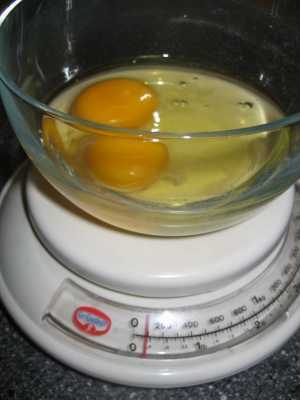 The water is only used to adjust this ratio - so if you have enough egg, you won't have to add extra water. Or, if your egg already weighs too much (large eggs), take a bit of the egg away. 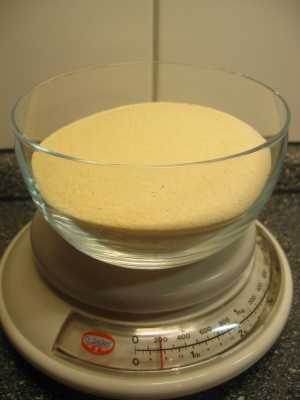 Weigh your semolina durum wheat. Weight the eggs and water together. You should have 43% - 45% of the weight of the semolina. 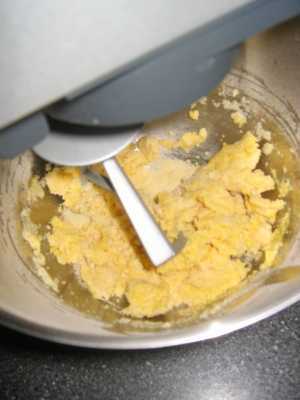 Put the semolina in the food processor or mixer and add the eggs and water. We just started mixing and the ingredients are starting to combine. After about 2 minutes, we have the right consistency. Cover it and let it rest for 5 minutes. 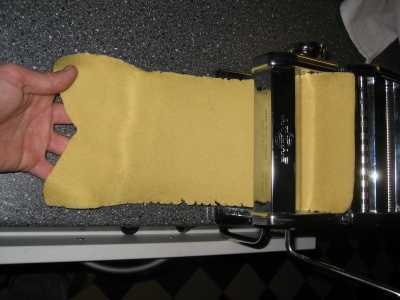 Fix the pasta maker to your work surface. 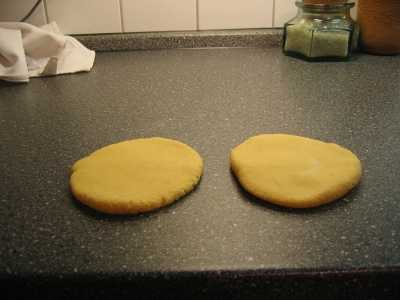 Divide the dough into two, form two balls and flatten them. 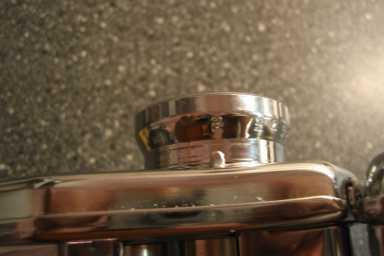 Turn pasta maker setting to "1". 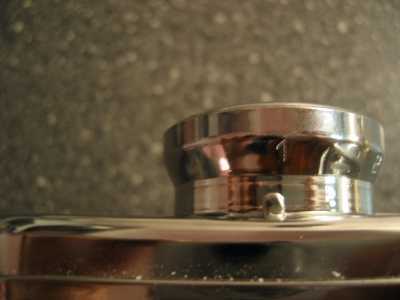 Fold both sides over to the middle as shown in this photo and roll out again. 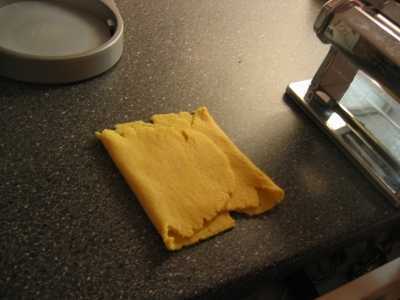 Repeat three or four times until your pasta sheet is nearly rectangular. ... and roll out again. Repeat rolling out with the next position of the cylinders, up to number 6 (if you like your tagliatelle firm and a bit "chunky") or number 7 (if you prefer them tender and thinner). The "scarf" gets pretty long. 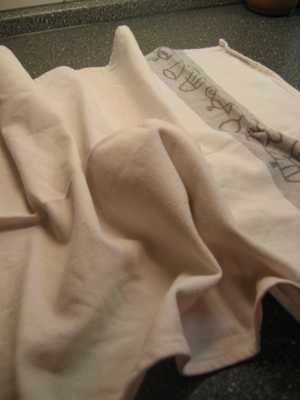 Make sure there is enough room for it and take the folded scarf out from time to time. Cut off the end with the back side of a knife. 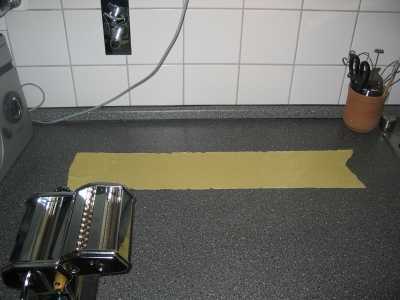 Here, we are cutting tagliatelle. 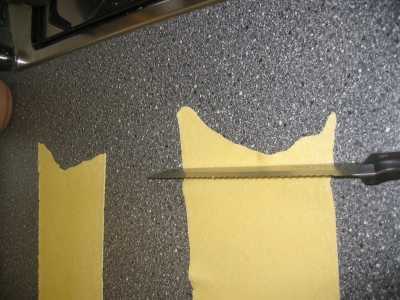 Just before you reach the end of your pasta, hold the tagliatelle with your hand and cut the rest of the sheet. 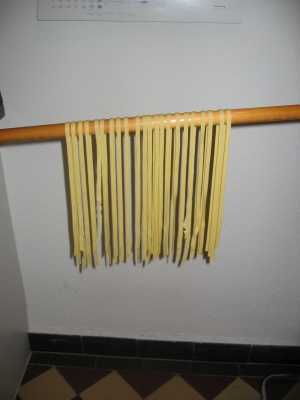 Hang the pasta over a broomstick to dry or use it immediately. 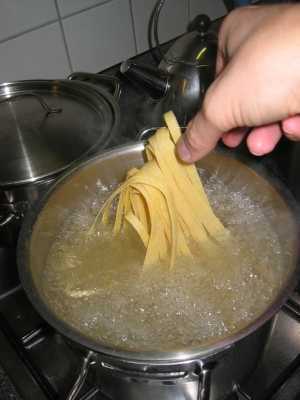 Take a large saucepan and use 10 x as much water as the weight of the pasta you want to cook. 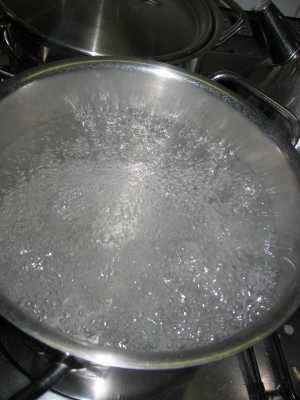 Bring the water to a boil and put the pasta into the boiling water and cook for 2 minutes or until "al dente". 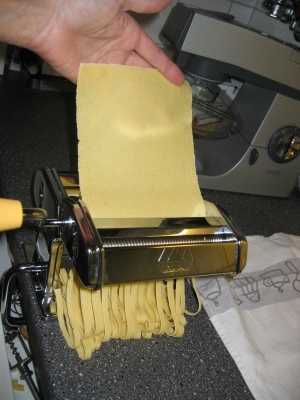 Don't cook for more than three minutes - fresh pasta is quite delicate. 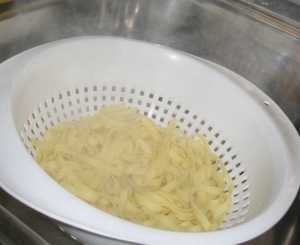 When the pasta is done, pour the saucepan out into a colander. Serve immediately. 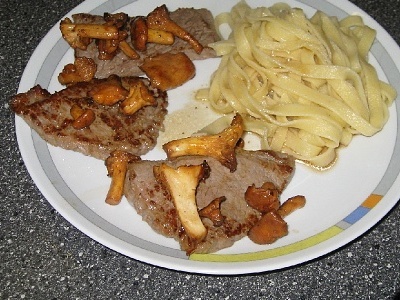 Here with scalopina, jus and chanterelle mushrooms. 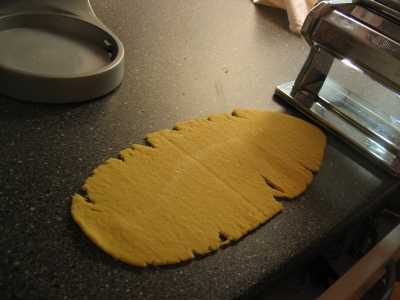 10 thank you so much ...I love this pasta..
10 How to shape gigli from durum semolina. 10 Fantastic its great to see the pictures as you follow the instructions because you get a better feeling of how you are doing. 10 Brilliant site thanks, really like the option for adjusting the ratio of ingredients! 10 I really liked this!!!! I have looked all over the internet. I made pasta but I overcooked it. Great!!!! 10 simple and easy Just what I was looking for than you! 10 Pictures were good, instruction clear. 10 loved the pictures, easy to understand. tryed jamie olivers recipe, but this is so much better!!! 10 Fresh pasta cannot be cooked al dente. Only dry pasta can. 10 Thanks, clear and useful. 10 I love the pictures! Good job! 10 Thanks for taking the time to do/share this - much appreciated! 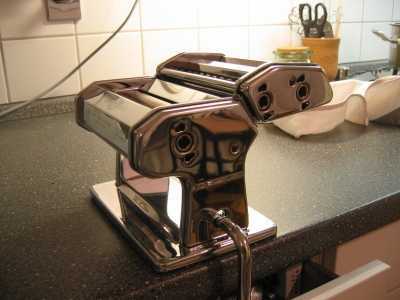 10 Just bought a pasta machine with directions in ITALIAN!! Love this guide- think I can do this. Had homemade pasta in NYC and loved it. A big Difference. 10 Loved you realistic process, easy to follow instructions. Many thanks! 10 Brilliant - love the instructions with the photos. They make it very easy to follow. Many, many thanks, I am very grateful!!! 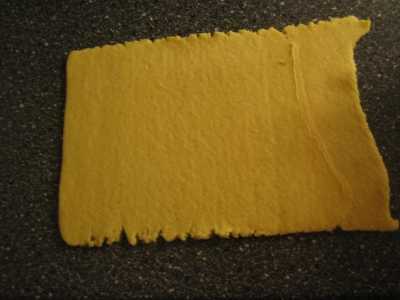 10 Absolutely clear instructions for someone about to make fresh pasta for the first time, and best i have found. Thank you. 10 Very detailed! thank you! 10 Thanks! I love it. Very simple and easy to do. 10 I bought a new pasta maker but the instruction sheet is unclear. I found this web page and your instructions are very clear and easy to understand. Very helpful, thankyou.